Our SAN Shaker Cup is the perfect take-anywhere option for mixing all kinds of drinks. Whether it’s protein drinks, crash weight gainers, diet shakes, isotonic recovery drinks, or meal replacements, our shaker cup is a convenient way to have a perfectly mixed drink anywhere you go. With a large 700 ml/ccm, or 25 oz, potential volume plus enough space to shake and get your drink properly mixed, it’s the ideal container whether you mix your drinks before you leave or prefer to shake it up on the road. With an integrated scale on the shaker bottle and transparent design, you’re guaranteed to get accurate measurements every time. There’s even a removable screen to help break up your powder and prevent lumps, and there’s the the integrated spout on the lid so you can enjoy your drink right out of the shaker, or close it up for leak-free carrying. 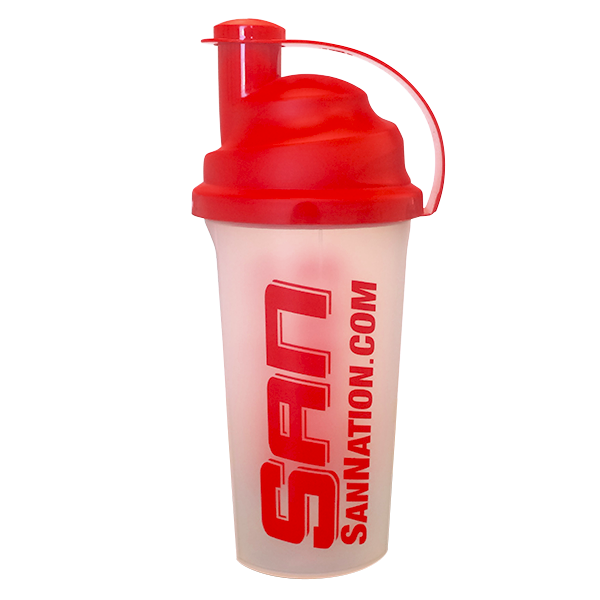 Whether you find yourself needing to mix drinks at home, in the gym, on the road, or at the office, our convenient, reliable, and affordable SAN Shaker cup is your perfect companion.